My friend TeapotGirl gave me Lupicia’s Handy Cooler as a gift last year. I have been using the hell out of it to make cold-brew iced tea. It’s great. I can drink so much of that stuff. Here is the cooler in action. 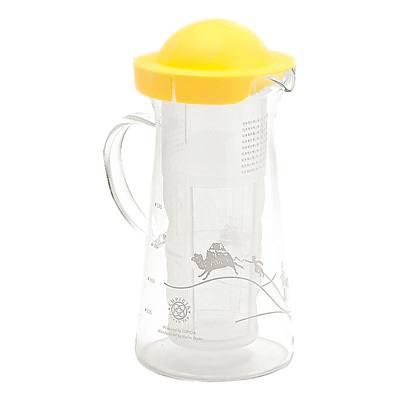 It’s got a fine-mesh insert that you put loose tea leaves in. You can also use bags without the mesh insert, if you prefer. Fill the cooler with cold water and place in the fridge overnight. Drink up, yum. Making iced tea with cold water takes a bit longer, but the taste is really delicate and completely lacking in any bitterness. I visit Lupicia’s physical stores a few times a year. Two of my favorite loose teas from them right now are La Belle Epoque and Peach. Both make excellent iced tea. For bagged tea, I have a particular fondness for Triple Leaf’s Ginger Tea, which is basically just a bag of dried ginger. It’s lovely on a hot day.